Interact Australia’s purpose is to champion and support people with a disability in their choices, based on principles of opportunity, participation, inclusion and equality. 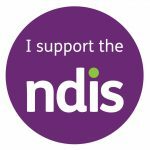 To be a leading national provider of quality, integrated services for people with a disability. Living with a disability and looking for supports?